Some new research on travel published in the Urban Studies Journal suggests city-dwellers who live denser, more eco-conscious lives tend to toss their “green” efforts to the side while on vacation more than suburbanites or rural folk. While compact cities may be a greener way to live, additional travel is an unexpected side effect. Those living in denser cities tend to go for “compensatory travel” where they make up for their lack of nature in their own living area by enjoying extra leisure while on vacation. Environmentalists who rarely drive during the week have a tendency to fly more on holidays than those who are less active in environmental affairs. Oh, and don’t forget those who work at home during the week. 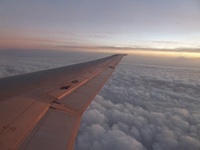 They are more likely to take cheap getaways, even if it involves flying across the country. This phenomenon reminds me of people who “cheat” on their diets while on vacation. We’ll all eat healthy at home during the week to stay on track, but even if it’s just a weekend camping trip with family, we’re less likely to feel bad about indulging in a few hot dogs and some s’mores. It’s vacation so it’s supposed to be guilt-free and fun, right? Hopefully the US will get a move on the cross-country bike paths so more people can travel via bike as opposed to car or plane. Do you indulge a little extra and throw guilt aside while on your last vacation?